We are gearing up for a big 100 days campaign! The goal is to reach 100% of our financial budget set by Wycliffe within the first 100 days of 2016. It’s a God-sized goal that only He can make happen! How and what are we going to be doing in the USA as Wycliffe missionaries? We are preparing to continue serving with Wycliffe here in the USA, in fact, here in Missouri. For both roles, we’ll be working from home since we’ll be working with people from all around the USA and the world. David will be an IT Recruiter. He will be spending time with IT professionals who have expressed interest in serving with Wycliffe. This is a huge need in Wycliffe for IT roles around the world to be filled as the rate of Bible translation explodes due to technology. For example, one IT professional in the North region of Cameroon would support 17 Bible translation projects. We once heard and fully believe, that computers and the internet were created for Bible translation, God just lets everyone else use them. There are very few people who have worked in a professional IT career, served in an IT role in missions and returned to the USA and want to share this with others in order to encourage others to serve. DeAnna will be a Launch Coordinator. When someone begins the application process to serve with Wycliffe, she will walk them through the process, which includes ensuring they get the training they need, connect with others about building their partnership team, even get to walk with them during their first term on the field. 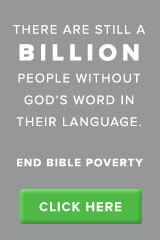 Even though we are serving in the USA, our monthly compensation is dependent on individuals like you who want to partner with us in ending Bible poverty so every remaining language and people group can have the Word of God in a language that speaks to the heart of that person and people group. This entry was posted in home, Wycliffe and tagged Home, Wycliffe. Bookmark the permalink. Praying daily that your God-size goal will be met by the one who supplies all our needs according to HIs riches in Christ Jesus. I am excited to hear the news that the goal has been met even in less than 100 days. We appreciate your prayers and we are looking forward to the day when we can share 100% has been met. As of today, we are at 51%. I think you are making great progress. If it is true that God is able to provide exceedingly abundantly above all we could hlpe for or imagine, and I believe it is) – See Ephesians 3:20-21, then I will look forward to the moment when you say we have reached 100% and more. We love your answer to the call and the winsome way you go about carrying it out!